Boult Audio claims that the Flex headphones deliver two-days stand-by and 8-10 hours of playback time on a single charge. 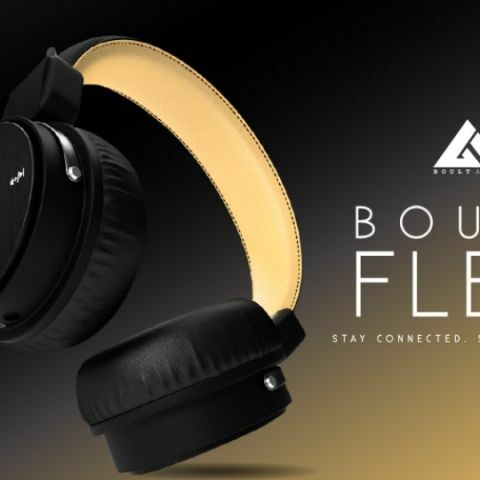 Boult Audio has launched Flex bluetooth wireless on-ear stereo headphones with Mic for Rs 1549. The company claims that the drivers of the headphones are capable of reproducing superior 3D extra bass acoustics and it is claimed to deliver two-days stand-by and 8-10 hours of playback time on a single charge. Boult Audio is proud to announce the Boult Audio Flex Bluetooth wireless on-ear stereo headphones, packed with new features and innovations, bringing professional audio in a complete wireless configuration. The flex incorporates the bests of both worlds with its dual mode functionality. It comes with a high quality braided cable that ensures uninterrupted playing even if you run out of battery. The Flex has great passive noise cancellation and offers a host of integrated functionality built in to the ear cup with its on driver audio controls like volume control, play pause button along with a built in condenser MIC to pickup high quality voice. The Flex like its name is super flexible and can be stowed away in your backpack safely. The drivers are capable of reproducing superior 3D extra bass acoustics which means they deliver improved audio performance over conventional stereo wireless headphones. In the heart of the Flex lies the industry approved Qualcomm CSR8635 Bluetooth which produces a seamless and lossless wireless transmission for silky smooth calls. The Flex is compatible with all operating systems, Bluetooth, iOS, Android, Blackberry and others. The Flex headphone is a beast with 2 days stand-by on a single charge and 8-10 hours of playback time. - Ear-cups and head band covered with sweat proof protein leather. - Deep Bass, Crisp mids, and Vivid Highs. - Ultra-strong aux cable, braided for extra protection and durability. - Easy-to-use in house controls buttons to accept calls and play, pause or skip music tracks.